Last year in the VFL, I achieved all my goals that I had set for myself. I umpired the state game over in South Australia, finished off the year with the VFL grand final at Telstra Dome and an AFL contract. At the age of 12, Chris Gordon accepted that his dream of playing AFL football would never be realised. His hope that a cure or a new miracle drug would be found for the life-threatening blood disorder Haemophilia that he had been born with, had not come to fruition and the game was getting too rough and risky for him to play. Instead, Chris made the decision to stick with the game he loved so much, but in a different capacity – as an umpire. In 2014 Chris was a boundary umpire for the AFL Grand Final at the MCG. This was the result of a long journey and a great deal of hard work and dedication which started many years ago. How did the Chris Wise Scholarship and Challenge help in you becoming an AFL umpire? The scholarship enabled me to purchase better running shoes for training and my games as we wear them out quite quickly. The quality running shoes were better for my legs and feet to cope with all the running. 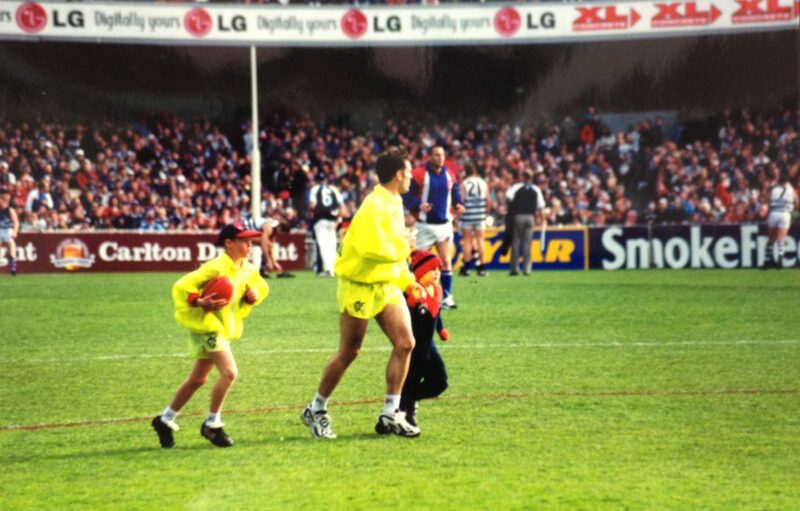 Challenge always supported me through, from the time I first started umpiring, then at the VFL and now AFL. Challenge did a lot for me when I was little that I will never forget. Their support was very valuable to me. Because I was under 18, my parents had to drive me all over Victoria in local and VFL football as well as having to buy my shoes for those levels. I wanted to help them out a little bit and buy my shoes to take some pressure off them and that is what the Christopher Wise scholarship helped me with. Yeah definitely, it’s something that no matter who you are or what you do, you can use the money to purchase better things or equipment that will help you later on in achieving whatever you want to achieve. It takes the pressure off you and your family and allows you to continue focusing on the goals you want to achieve without worrying about how much things cost. Last year in the VFL, I achieved all my goals that I had set for myself. I umpired the state game over in South Australia, finished off the year with the VFL grand final at Telstra Dome and an AFL contract. Each year I set new minor goals and my goals are to work hard, have a great first year of AFL and umpire at least 15 AFL matches in 2009. My long-term life goal is still to umpire in an AFL Grand Final and to get to the illustrious 300 AFL matches. Chris was born with Haemophilia, a severe blood disorder that was deemed life-threatening at the time. Today, children diagnosed with the illness have medical advancements to thank for the fact that it is no longer life-threatening. It does, however, affect the lifestyle choices of those living with it, and at times can limit what activities they can participate in. Haemophilia is a bleeding disorder in which the body does not make enough of the essential clotting factors we need, either Factor VIII or Factor IX. Bleeding is mostly internal, usually into the joints or muscles. These bleeding episodes, or “bleeds”, may occur spontaneously (apparently without any cause), or as a result of trauma (injury). Bleeding can be stopped by infusion of the appropriate clotting factor by intravenous injection. If internal bleeding is not quickly stopped with treatment, it will result in pain, swelling and damage to the tissues. Over a period of time bleeding into joints and muscles causes permanent damage (such as arthritis in the joints) and chronic pain. His parents Margaret and Lindsay, although initially devastated at the news, realised that Chris would still have a good chance at a full and active life.